Presented by NYU Dream Team. 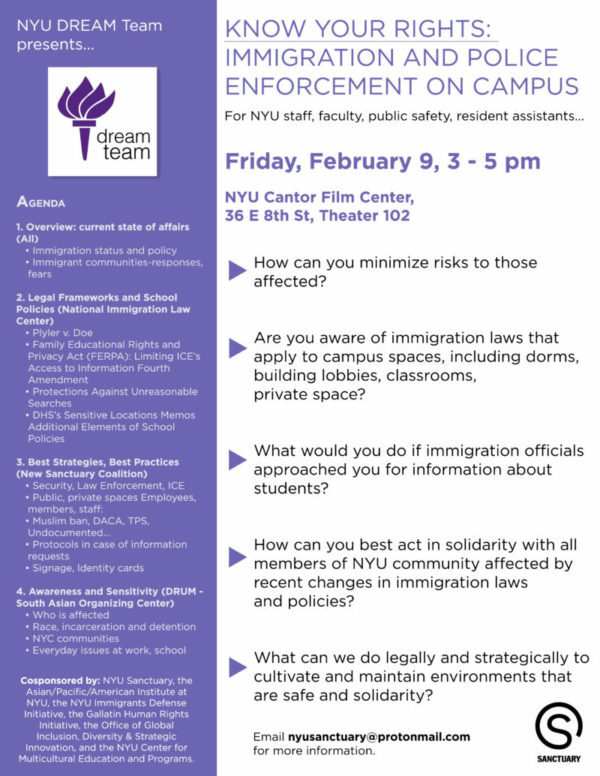 Co-sponsored by the Asian/Pacific/American Institute at NYU, NYU Immigrant Defense Initiative, NYU Office of Global Inclusion, Diversity & Strategic Innovation, Gallatin Human Rights Initiative, NYU Center for Multicultural Education & Programs, and NYU Sanctuary. How can you minimize risks to those affected? Are you aware of immigration laws that apply to campus spaces, including dorms, building lobbies, classrooms, private space? What would you do if immigration officials approached you for information about students? How can you best act in solidarity with all members of TNS community affected by recent changes in immigration laws and policies? What can we do legally and strategically to cultivate and maintain environments that are safe and solidarity? This event is open to the public. No RSVP required. Questions? Email nyusanctuary@protonmail.com. Image: Know Your Rights, Matt Green, Attribution-NonCommercial-ShareAlike 2.0 Generic (CC BY-NC-SA 2.0).